The Turner Prize has lost much of its capacity to shock, but it can still deliver modest surprises: Critics and bookies were caught off guard in December when the 2013 honors went to Laure Prouvost. Ms. Prouvost, born in France but based in Britain, was the dark horse on the shortlist for the Turner, presented to a British visual artist under the age of 50; this year, it also included the puckish draftsman David Shrigley, the painter of imaginary figures Lynette Yiadom-Boakye and the conceptual-performance artist Tino Sehgal. Ms. Prouvost’s entry, the video installation “Wantee,” intrigued judges with its bizarre combination of family lore and art-world legend. Originally commissioned for a show on the German artist Kurt Schwitters, it explored the fictional life and work of her grandfather (in her telling, a conceptual artist who had been a friend of Schwitters). Now, with fortuitous timing, the New Museum is debuting a new work by Ms. Prouvost. Titled “For Forgetting,” it commands the lobby gallery with a mix of video, film and installation that, broadly speaking, explores the seductions, schemes and scams of the Internet. It’s instantly gripping, confirming that Ms. Prouvost is an artist to watch. But it also provides a sense of déjà vu; it turns out that, despite her many eccentricities, Ms. Prouvost is not totally an original. “For Forgetting” owes a lot to the brazenly aggressive, hyperfeminine video installations of Pipilotti Rist and, especially, to Sophie Calle’s text-and-image narratives of love, loss and longing. Her debts are most apparent in the installation surrounding the film, which includes a deliberate nod to Duchamp (a peephole wall evoking “Etant Donnes”). 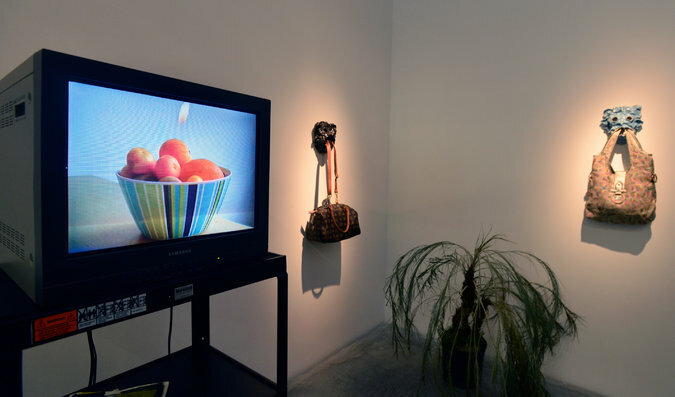 Viewers approach, peer into and then enter a pink-and-white domestic environment where handbags hang on handmade ceramic hooks, empty snack-food bags litter the floor, and short videos play on old-fashioned television monitors. The pace builds to a crescendo, as more dubious offers are made: A yacht appears, and a beach house “given to you by an uncle in Nigeria.” Sexual fulfillment is promised, via screenshots of Internet chats and a glimpse of a tongue licking a keyboard. The viewer is made to feel privileged. Ms. Prouvost is especially good at sending up the precision and personalization of digital marketing, with statements like “You are the unique recipient of the golden number,” and “We’re really happy you decided to come. Not someone else.” But the film isn’t just a satire; it hooks you like a mystery or thriller that revolves around memory loss or mistaken identity. Piecing these missives together, or trying to, you have to admire Ms. Prouvost’s way with language (even when she veers into territory staked out by Ms. Calle, whose works often take the form of emotional letters). She has an ear for the false intimacies of digital interaction; the decorative set design of the installation may be intended to have a similar effect, its homey touches lulling you into a sense of security. Meanwhile, the shorter messages that punctuate the installation seem to mock the commanding tone of earlier classic conceptual text art, with what the museum’s assistant curator Margot Norton aptly calls “wonky directive syntax.” A big sign facing the lobby, for instance, reads “IDEALLY THIS SIGN WOULD REMEMBER YOU”; it’s similar to those Ms. Prouvost installed at the Frieze Art Fair in 2011. Further instructions issue from the brief videos. One invites you to set fire to buildings and bowls of fruit simply by snapping your fingers; another is modeled on an infomercial, with Ms. Prouvost, in a hand-drawn paper mask, as the spokesmodel. As with many of her earlier films. you feel simultaneously empowered and manipulated. Ms. Prouvost is still figuring out how to extend the seductive confusion of her films into sculptural installations, to judge from this show. But thanks to the Turner win, we’ll most likely be seeing more of her and, ideally, less of her artistic forebears — aside, perhaps, from that mysterious grandfather. “Laure Prouvost: For Forgetting” runs through April 13 at the New Museum, 235 Bowery, between Stanton and Rivington Streets; 212-219-1222, newmuseum.org.